When you have a small kitchen, there is no room for extra fluff. It’s important for every item to have a place and a purpose. Function is your friend. But when the holidays roll around, I always find myself wanting to add a little cheer to the kitchen. After all, it’s where we spend a lot of our time, especially during the holidays when we’re baking frequently and preparing dishes for gatherings with friends and family. 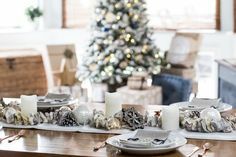 So how can you add a Christmas touch to your kitchen without making it feel cluttered and ultimately losing any form or function to the space? 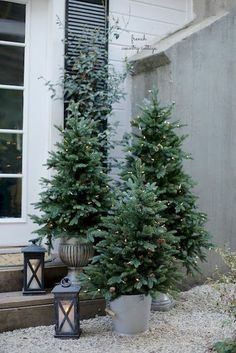 Keep reading for a few tips I’ve found useful when I’m trying to add a bit of holiday cheer to my small space. Hang a wreath: A wreath can add so much to any room any time of year, but during the holidays, it helps to bring the cheer into your kitchen. The best part is that it doesn’t take up any space on your counters. Hang it on a range hood or small window over your sink. Add garland: Garland is another simple way to add decor to any room any time of year, and again, it doesn’t take up any counter space. 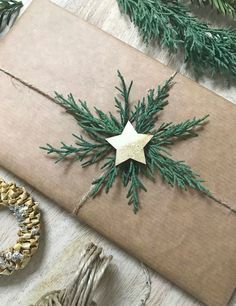 If you have plain greenery, you can add a pop of color with red beads, or some glitter with sprays from a craft store. Last year, I hung plain green garland on the small window above my counter. I added white beaded greenery and twinkle lights to keep it neutral. Swap a crate, pot, or dishes for holiday colors/theme: I found these precious cement bowls at Painted Mill last year and love using them around the house during the holiday and winter seasons. They are adorned with white deer and stars, so they don’t need to be changed out after Christmas. I use them with candles, greenery, vase fillers, or Christmas treats. In the kitchen, I simply swapped out my plain white pot for the cement pot to house my faux IKEA greenery. Hang Fairy lights: Here’s another idea to add a cozy vibe to your home any time of year. Fairy lights always make a room festive and welcoming. Brooke from Nesting with Grace added them to the garland around her window in her small kitchen. You can see they light up the space and draw you right in when you enter her home. Display a small Christmas sign: I found this cutie at Target in the dollar spot. Always an exciting hunt when you enter the store and see those red dots and shelves filled to the brim with new and unique goodies for less than $5. This can be hung or sat on the counter, depending on the space you have available. I sometime hang a sign above my coffee bar to avoid cluttering the counter. But this year, I moved a few other items we don’t use too often off the counter to make room for my simple holiday touches. Add greenery or a small ornament to jars/canisters: Here is another great way to add to and update what you already have without adding clutter. When you have items on your counter that are useful, adding a little greenery or adornment goes a long way without comprising the function of the space. You can find festive sprays at your local craft store, usually for less than $5 a piece. Simply tie them around the rim of a jar or canister with jute or ribbon and the items in your kitchen will bring you joy every time you use them. I love the simplicity of the greenery Liz from Love Grows Wild added to her baking jars last year. Swap out dish towel(s) for festive towel(s): This is one of the simplest changes you can make in your kitchen to add a cozy, Christmas feeling. Swap out your generic dish towels for Christmas or winter themed towels. You can find a bundle of 2 or 3 towels from Marshall’s or even in the Target dollar spot. And I always keep my eyes peeled at the end caps for a clearance deal on Magnolia or Smith & Hawkin items. I found this embroidered Magnolia peace towel in a bundle on an end cap last year for less than $10. Add a festive candle: I love keeping a candle on the stove throughout the year, but during the holidays, I burn a festive candle. Some of my favorites over the years were found at Marshall’s and T.J. Maxx. They have great candles that burn for many hours and you can’t beat the price. You can always opt to make you own too. You know I love a good DIY idea! This adorable candle is festive and takes up so little room on your counter, it’s perfect for a small space. Head to Seeking Lavender Lane to see how Deb made these simple Christmas votive candles. 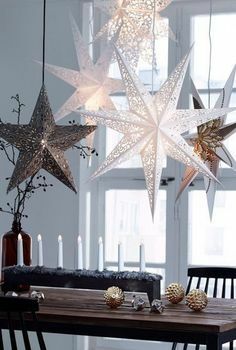 Hope you find these tips helpful when decorating your small kitchen for Christmas this year! Remember, simple is better and function is always important. Find things you can easily swap out or add to your year round items, so you don’t add extra clutter to your small space!